Description: Vital Signs is a 2D, single player, browser-based game designed to recreate the clinical reasoning and priority setting of a nurse on a typical medical/surgical unit. The game-based simulation recreates the challenges of a Med Surge ward to exercise user decision making and prioritization under stress. 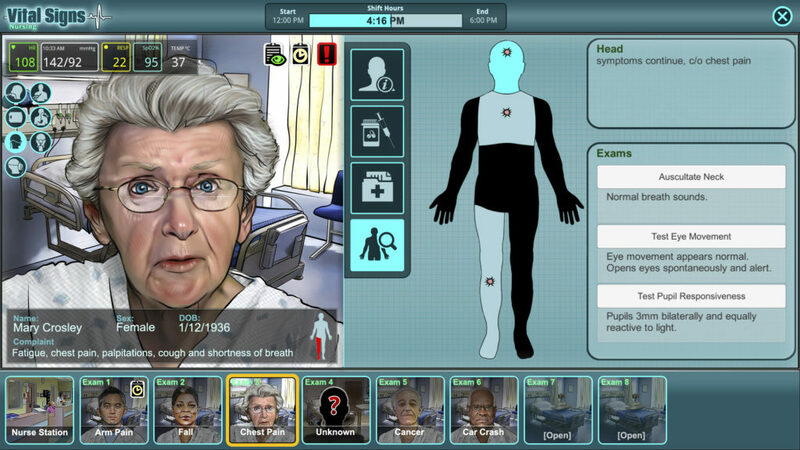 Skills and Ideas Taught: The player must use the five steps of the nursing process (assess, diagnose, plan, implement, and evaluate) for multiple simultaneous realistic patient simulations under time pressure. While making essential care decisions, the player must also manage minor events designed to increase their critical thinking skills and priority setting abilities. Goal or Challenge: To manage medical surgical patients in the stressful multi-patient care environment. Primary Audience: New nurses and nursing students. Assessment Approach: The learner’s performance is measured against an ideal case management process. Scoring information is provided across a number of critical dimensions. The application records the players’ choices throughout the simulation for post-play performance review.